In this class, students learn the keys to the quick-cooking technique of stir-frying. This page serves as a digest of what we cover in class. Stir-frying does require a fair amount of prep work to get the protein, vegetables, aromatics, and sauce ready for cooking. Indeed, with stir-fries, most of the work is front-loaded and occurs at the countertop; once you turn on the burner, it’s just a matter of minutes before dinner is on the table. In this class, students practice the fundamentals of stir-frying, including learning the importance of mise en place, reading a recipe completely in advance, and keeping a workspace organized and clean. This page serves as a digest of what we covered in class. The swiftness of stir-frying means that there’s not much time to compensate for any missteps. Here’s what you need to know before you start cooking. There is considerable technique involved with turning out a masterful stir-fry. These are three of the most important; remember these when stir-frying and you’ll be happy with the results. In professional kitchens, this preparedness is referred to as mise en place, French for “put in place,” and it means measuring and laying out all the items you’ll need to execute a recipe. Mise en place is important for cooking in general, but with stir-frying it is imperative because cooking occurs so quickly that in the time in takes you to search for, say, the sesame oil, your stir-fried chicken may turn tough and rubbery. STEP TWO: CUT PROTEIN AND VEGETABLES TO RIGHT SIZE Making sure that the protein and vegetables are cut to just the right size will help ensure that they cook evenly and properly. If the pieces are cut too small, you risk overcooking and the added volume may require you to cook an additional batch. On the other hand, if cut too large, the food may not cook through and the quantity may appear too scant. STEP THREE: HEAT PAN WELL In most cases, high heat is the best heat setting for stir-frying because it helps with browning. Over high heat, when food is added to the pan, the pan will quickly regain its temperature so that moisture cooks off and the food sears nicely. The exception to the high-heat rule is shrimp—shrimp have a superior texture when cooked over medium-low heat. The prep steps might be many, but the number of pieces of equipment necessary to put together a stellar stir-fry are few. Here are the must-haves. Chef’s knife: A sharp chef’s knife (and we emphasize the sharp part!) is really the only knife you need for stir-fries. It can thinly slice your protein and finely mince ginger. Look for an 8-inch blade that provides plenty of power without being unwieldy. The blade of a good chef’s knife should have a long, gently slopping curve suited to the rocking motion of mincing and chopping. Tongs: Acting like an extension of the hand, tongs can slip and stir the protein and vegetables in any stir fry. They can also safely pick up a piece of broccoli or beef when it comes time to check for doneness. We like stainless steel tongs with rubber grips that enable us to hold the tongs comfortably and securely. Nonstick skillet: Skip a wok—the traditional choice for stir-frying—in favor of a large, heavy-bottomed nonstick skillet. The bottom of a wok doesn’t make enough contact with the heat source, so the walls of the wok will remain woefully underheated. The diameter of a large skillet provides a wide, broad cooking surface that promotes good browning, which translates to great flavor. We like a nonstick pan (to reduce the amount of oil needed). A heavyweight skillet that heats evenly and quickly recovers heat each time food is added to the pan is essential. 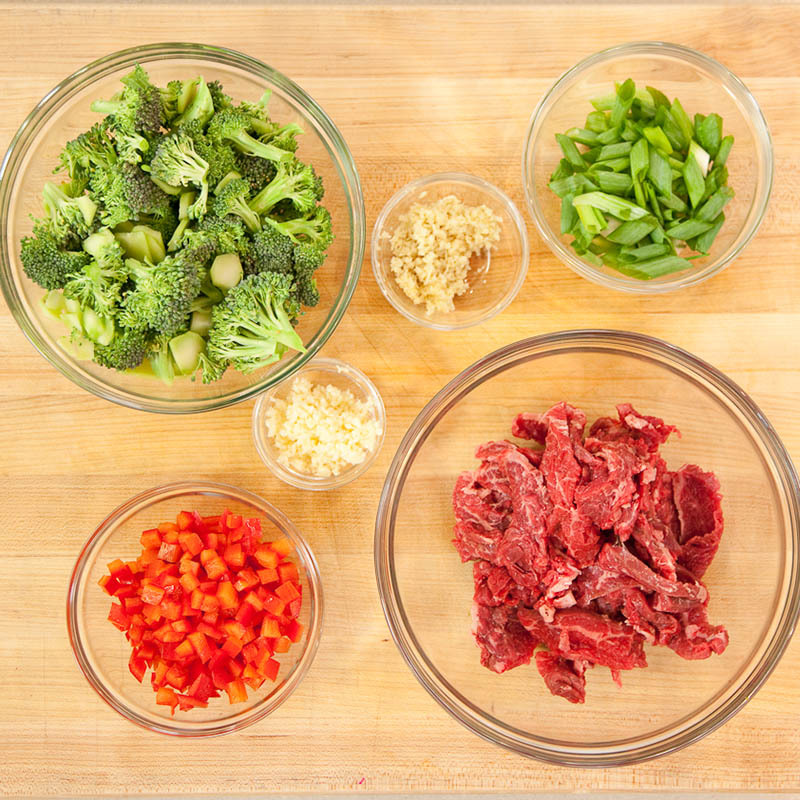 Prep bowls: The key to a stress-free stir-fry is having all of the components prepped before starting to cook. This means have several prep bowls of various sizes ready to hold everything from marinated meat to minced garlic. Stir-fries move quickly once you start cooking them. Use these tips on the proper technique and you can apply them to a variety of vegetables and proteins. A quick marinade that includes salt or a salty ingredient such as soy sauce guarantees that the protein will taste well seasoned. Depending on its ingredients, a marinade can act as a brine so that the protein takes in liquid to help keep it moist with cooking. If the marinade includes liquid, it’s necessary to first drain off any moisture before stir-frying so that the protein will brown in the pan. Making sure that the protein and vegetables are cut to just the right size will help ensure that they cook evenly and properly. If the pieces are cut too small, you risk overcooking and the added volume may require you to cook an additional batch. On the other hand, if cut too large, the food may not cook through and the quantity may appear too scant. Skip a wok—the traditional choice for stir-frying—in favor of a large, heavy-bottomed nonstick skillet. The bottom of a wok doesn’t make enough contact with the heat source, so the walls of the wok will remain woefully underheated. The diameter of a large skillet provides a wide, broad cooking surface that promotes good browning, which translates to great flavor. We like a nonstick pan (to reduce the amount of oil needed). A heavyweight skillet that heats evenly and quickly recovers heat each time food is added to the pan is essential. In most cases, high heat is the best heat setting for stir-frying because it helps with browning. Over high heat, when food is added to the pan, the pan will quickly regain its temperature so that moisture cooks off and the food sears nicely. The exception to the high-heat rule is shrimp—shrimp have a superior texture when cooked over medium-low heat. Protein and vegetables usually cook at different rates, so it’s necessary to stir-fry them in separate batches and bring them together at the end, just before serving. Also, cook meat and poultry in batches with space between the pieces so that they brown well (remember: browning means flavor). If a pound of thinly sliced beef is crowded into a skillet, the temperature of the skillet drops and the meat turns unappealingly gray and steamy. Depending on the quantity and type, vegetables may or may not need to be cooked in batches. Many stir-fry recipes call for adding aromatics such as minced garlic and ginger to the pan early on in the cooking process. We prefer to add the aromatics near the end of cooking so that they don’t scorch. If there are vegetables in the pan, we push them to the side, forming a clearing in the center of the pan, and add the aromatics to the clearing. By mashing the aromatics with a wooden spoon, we ensure that the mixture cooks through—and won’t taste harsh or raw in the finished stir-fry—before integrating it into the vegetables. Challenge Recipe! Try sauteing. Now that you are comfortable cooking in a very hot skillet, you can easily move from Beef and Broccoli Stir-Fry to Garlic-Rosemary Pork Chops. Give them a try!